After your magnolia tree matures and starts getting very wide and tall, you may wonder whether or not to prune it and, if so, how and when to do so. There are some general rules to follow here that will give you guidance. But there are also exceptions to the rules. 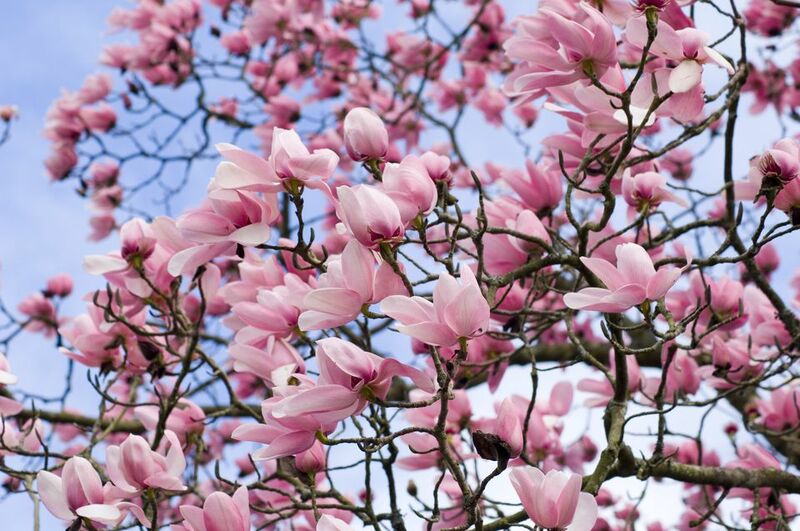 Do so just after flowering is done, not only so you can at least enjoy the current year’s blooms, but also because magnolia trees bloom on old wood (which means that pruning too late in the year puts you at risk for losing the buds for next year's flowers). Trim off only a small amount, with an eye to shaping the plant to your liking. Make your cuts with pruners or loppers that have first been thoroughly disinfected (for example, with ethanol or isopropyl alcohol) and sharpened. Cut off dead branches first. Next, inspect the plant for areas where two branches are rubbing against each other; decide which one will lend itself better to the overall shape you are aiming for, then remove the other one. Finally, prune off any limbs that you suspect are infected by a disease (you want to make sure that the disease does not spread). Disinfect your cutting tool once again after this part of the job is done and before continuing to prune. Make clean cuts with your pruners. Prune all of the way through the wood. Do not leave a branch hanging "by a thread" and then attempt to yank it off with your hand. In the process, you could end up ripping some bark off the trunk. During a severe wind storm (or snowstorm or ice storm), a huge pine bough falls on your Jane magnolia tree (Magnolia Jane). An accidental "pruning" results from the damage and the tree's leader is broken, altering its shape and growth habit forever. Your Jane magnolia takes on a shrub form thereafter. After such damage from a winter storm, you may wish to change your approach to how you prune the magnolia. Accepting the fact that it will now be growing as a shrub (not a tree), maybe you will now want to prune it so as to give it the most pleasing shape that you can within the limits of its new plant form. The tree form may have been the ideal, but it is advisable to adapt your expectations and your pruning regimen to the new reality. By pruning the damaged plant judiciously, at least you will be able to maintain it as a compact shrub that fits neatly into a designated nook or cranny in your landscape. Depending on your personal tastes, while the "wild look" may suit a magnolia just fine in tree form, a more manicured look may suit the plant better in shrub form. By taking advantage of the fact that the plant is just starting out, pruning can ensure that the mature specimen will have a shape suited to your tastes. For example, remove low branches if you prefer a tree form. That way, energy will go into creating stronger upper branches. This early pruning can also promote better flowering.